on is that children follow in their parents' footsteps; child labour then is a means to learn and practice that trade from a very early age. Similarly, in many cultures the education of girls is less valued or girls are simply not expected to need formal schooling, and these girls pushed into child labour such as providing domestic services. Child labour in Brazil, leaving after collecting recyclables from a landfill. Agriculture deploys 70% of the world's child labour. Above, child worker on a rice farm in Vietnam. Macroeconomic causes Biggeri and Mehrotra have studied the macroeconomic factors that encourage child labour. They focus their study on five Asian nations including India, Pakistan, Indonesia, Thailand and Philippines. They suggest that child labour is a serious problem in all five, but it is not a new problem. 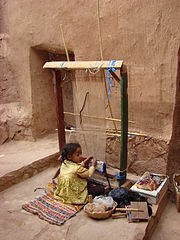 Macroeconomic causes encouraged widespread child labour across the world, over most of human history. They suggest that the causes for child labour include both the demand and the supply side. While poverty and unavailability of good schools explain the child labour supply side, they suggest that the growth of low paying informal economy rather than higher paying formal economy is amongst the causes of the demand side. Other scholars too suggest that inflexible labour market, sise of informal economy, inability of industries to scale up and lack of modern manufacturing technologies are major macroeconomic factors affecting demand and acceptability of child labour.